Weill Cornell Medicine’s podcast series features in-depth conversations with our physicians and clinical staff on a wide range of health topics, from the latest medical advances to self-care tips for caregivers. Weill Cornell Medicine’s podcasts are divided into multiple series, where we hone in on one of our many specialties to discuss treatment options, address common questions and concerns and share patient stories and new developments in the field. No matter what your health journey looks like, we hope these podcasts help you make the best decisions for you and your loved ones. Whether you are recovering from an injury, chronic pain, or surgery, rehabilitation medicine can help you. 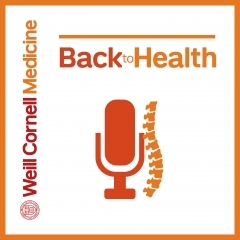 The Back to Health podcast features discussions with leading rehabilitation medicine specialists at Weill Cornell Medicine about the latest research, most pertinent issues, and surgical and non-surgical treatment options. Patients and caregivers will be better equipped to take charge of the rehabilitation and recovery process. New scientific developments are transforming the future of cancer treatment and care. Hosted by world-renowned hematologist and medical oncologist Dr. John Leonard, CancerCast is your window into research breakthroughs, innovative therapies and honest accounts of living with and beyond cancer. Brain and spine surgery is not only a complex and crucial process, but is often also urgent and acute. The Brain and Spine Care podcast features conversations with leading neurosurgeons about the most cutting-edge and effective treatments for subdural hematomas, movement disorders, and brain tumors. Patients and caregivers will better understand brain and spine disorders, neurosurgery, and the many different treatment options available today.